There are still lingering questions about what the opposition leader’s political future will be. 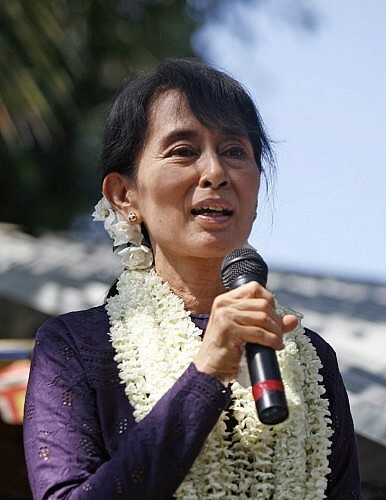 Aung San Suu Kyi, daughter of Burman national hero Aung San and darling-of-the-West democracy icon, has never shied away from presidential ambitions. In fact, her opposition party, the National League for Democracy (NLD), has campaigned to amend the constitutional prohibition (Article 59f) on Suu Kyi’s presidency. Suu Kyi herself said during the November 2015 election campaign that she would install an NLD-pliant president. As for her role, it is to be “above the president,” she declared in a press conference before polls in November last year. Given NLD’s stellar performance in the November 2015 elections, winnng some 80 percent of open seats in parliament (the military still retains a quarter of all seats), NLD’s bargaining position vis-à-vis the slowly reforming junta is strong. Yet a third round of talks on February 18 between newly reappointed military chief Senior Gen. Min Aung Hlaing and NLD leader Aung San Suu Kyi has concluded without any clear indication of agreement on a presidential nomination. Parliament has set a deadline of March 17 for the lower and upper house, along with the military bloc, to submit their nominations for the presidency. The president, to serve a five-year term, will be picked from the three candidates by a 664-strong joint-chamber, while the two losing candidates will become vice presidents. The vote will have to take place before the end of current President Thein Sein’s term ending on March 31, 2016. The successor takes office by April 1. The NLD has kept a tight media leash on its members of parliament, banning anyone from speaking to the media except Suu Kyi herself. This, along with a news blackout from all parties in the three-way negotiations, has contributed to media speculation that progress on the power-sharing front is slow and difficult. The planned last-minute vote before the April 1 deadline contributes to this perception. The military has been adamant about not entertaining talk of constitutional change to make way for a Suu Kyi presidency. Senior military MP Brigadier General Tint San Naing said he saw no way for parliament to suspend or change Article 59(f) of the constitution. Meanwhile, strident Buddhist nationalists are lobbying against a constitutional amendment specifically for a Suu Kyi presidency. A contingent of students, monks, and politicians from youth nationalist network Charming Smile has sought permission to demonstrate in Yangon’s Bahan township on February 28. These protesters are of the view that the constitution should not be amended for one person, even though they do support Suu Kyi. Power wrangling in Myanmar after the 2015 elections is by no means easy. The military is unlikely loosen its grip on power so easily despite electoral defeat. Suu Kyi has to wrestle power from the military’s hands whilst ensuring that she remains in charge after the transition, to see the country through its fragile post-election democratic consolidation. This entails sorting out a whole lot of tricky, nitty-gritty details, purportedly the subject of intense backroom negotiations, such as the inclusion of ministerial positions for the military in an NLD government of “national reconciliation”, as well as the posts of chief minister in Kachin, Shan, and Rakhine states. Rakhine state was the only state where the NLD was beaten into second place, by the Arakan National Party (ANP), and is one of several states still embroiled in ethno-religious conflict. For now, and for the foreseeable future to come, The Lady remains the only viable interlocutor between the Western interests and the recalcitrant military junta, as well as the only universally respected symbol for national reconciliation and hope in a country still marred by strife and poverty. Presidential proxy or not, Suu Kyi’s influence is set to loom larger than, or should we say above, the presidency. Yet at the same time, a country as large, varied, and complicated as Myanmar certainly cannot rely on singular leadership, however brilliant. Perhaps, then, it is time to think more seriously about Suu Kyi’s medium to long-term post-election role, given that her direct influence over affairs of the state is not sustainable indefinitely.